Read MOMA’s gallery label text for this poster. 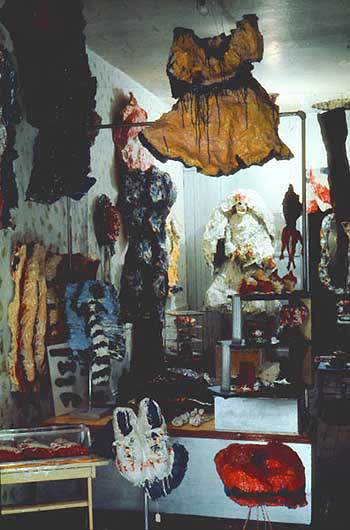 Michael Lüthy wrote about Claes Oldenburg’s “The Store” for Shopping. 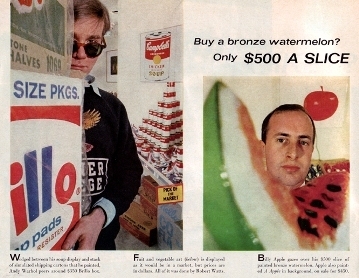 A Century of Art and Consumer Culture, ed. by Max Hollein and Christoph Grunenberg (a catalog for an exhibition at Tate Liverpool, Ostfildern-Ruit, 2002, p. 148-53). You can read an excerpt on Lüthy’s archive. You can see a large selection of sculptures from Oldenburg’s “The Store,” including “Bride Mannikin,” in Collection: MOCA’s First Thirty Years, at the Museum of Contemporary Art in Los Angeles thru July 12. 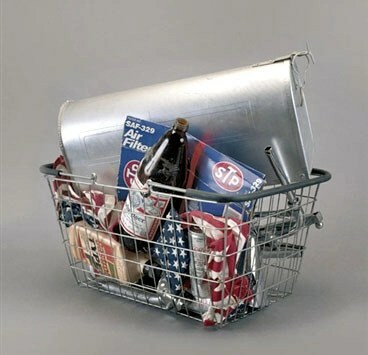 A collaboration between the great names of Pop Art including Andy Warhol, Roy Lichtenstein, Richard Artschwager, Robert Watts, Tom Wesselman and others, the exhibition is an evocation of an ordinary 1964 supermarket – complete with meat, cheese and fruit counters, neon signs and jaunty background musak. In the installation’s “aisles,” real foods are mixed together with iconic Pop works such as Warhol’s stacks of Campbell’s Soup cans and Robert Watts’ alluring chrome fruits and multi-colored wax eggs. The Cafe was intended to be a limited-run restaurant, staged once a week—Thursday nights from eight to eleven—in a rented location in downtown Los Angeles. It was to function socially as a meeting place for friends, members of the art world, and anyone else who wanted to drop by. 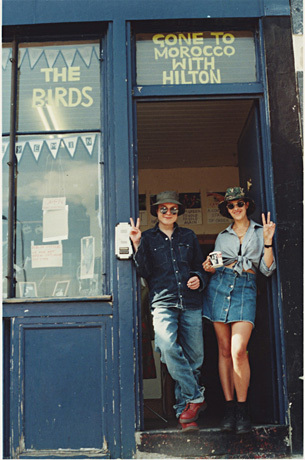 In direct opposition to what one might have expected from a young [Minimalist/Post-Minimalist/Conceptualist] artist at the time, the decor was familiar to the point of strangeness: hyperfamiliar, you might say today…. It was a place where any American would have felt at home. It was exorbitantly familiar…. 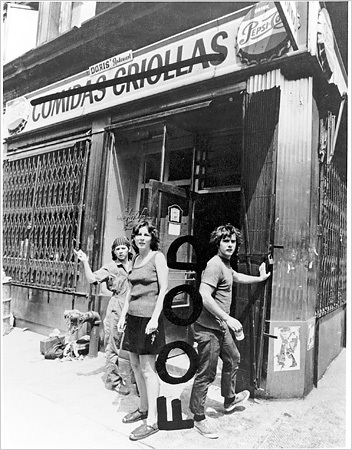 Promotion for Food, a restaurant by Gordon Matta-Clark and other artists. Photo: Richard Landry, alteration by Gordon Matta-Clark. Source: New York Times. 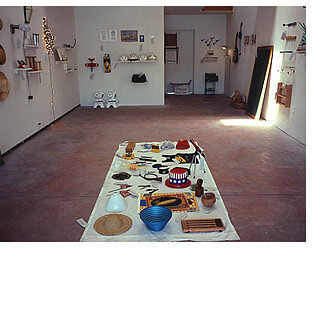 Haim Steinbach (born Rehovot, Israel, 1944 and living in New York City since 1957) has been an influential exponent of art based on already existing objects. Since the late 1970’s Steinbach’s art has been focused on the selection and arrangement of objects, above all everyday objects. In order to enhance their interplay and resonance, he has been conceiving structures and framing devices for them. A close-up shot of the awning and signage of the recently closed Pop Shop, posted October 9, 2005, on Global Graphica, blog of Visual Culture. Ivan Corsa Photo. Haring’s Pop Shop was recreated for Pop Life: Art in a Material World at the Tate Modern. You can read more about it in the catalog (purchase it from tate.org.uk or find it in the nearest library collection on worldcat.org), or visit the exhibition as it travels to the National Gallery of Canada, Ottawa from June 11–September 19, 2010. 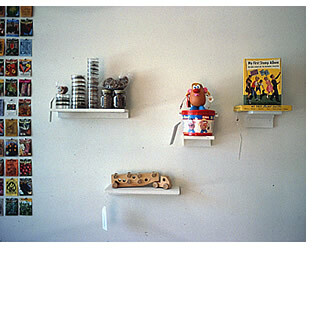 The Keith Haring Foundation maintains an online Pop Shop. Watch a short video on the installation at Art Forum Berlin on Vernissage TV. Or watch Cary Leibowitz’ artist’s talk in conversation with Glen Helfand at the Jewish Contemporary Museum in San Francisco on March 28, 2010. 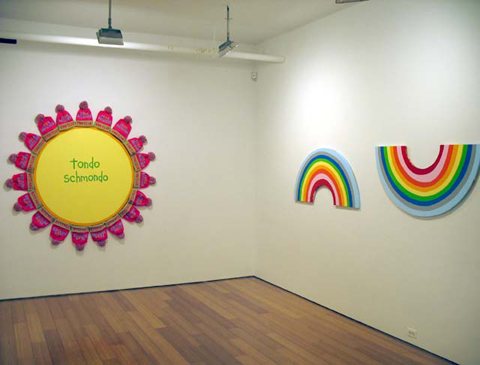 Watch extensive videos of Murakami discussing his works in the ©MURAKAMI exhibition at MOCA. One gets spat out of the Murakami’s wonderland not through a volcano, but through a fully operational Louis Vuitton boutique. And if the Vuitton bag exceeds the budget the true Murakami experience can yet be attained through a shopping splurge in the Murakami-equipped museum store. Without a clear boundary between them, exhibition visit and shopping blend together to a borderless state of full satisfaction or, as Murakami likes to call it an ‘ongoing study in meaninglessness.’ (from Anna Gritz’ review of the exhibition in Frieze Magazine.